Last week, a jury in San Jose, California awarded Apple Inc. damages in its long-running litigation against Samsung Electronics over several patents that cover technologies in Apple's iPhone and iPad products. When added to the damages awarded last year in an earlier trial, the total to be paid by Samsung to Apple is $930 million - one of the largest patent damage awards in history. To put the damages award in perspective, however, one needs to consider that the award is equal to just NINE DAYS' PROFIT for Samsung. In other words, pocket change, unlikely to dissuade the Korean electronics giant from continuing what the jury found was outright copying of Apple's patented product features. In addition, Samsung has already announced that it will appeal the verdict and damages award, so if Apple ever sees this money, it will likely be after another expensive round in court, and another year or more of delay and of sales of Samsung's infringing phones and tablets. In the past, inventors had another legal remedy that put teeth into the patent system: the injunction. District courts issued permanent injunctions as a matter of course once they adjudged the patent valid and the defendant's actions infringing. See, e.g., Richardson v. Suzuki Motor Co., 868 F.2d 1226, 1247 (Fed. Cir. 1989); MercExchange, LLC v. eBay, Inc., LLC, 401 F.3d 1323, 1339 (Fed. Cir. 2005). The Court of Appeals for the Federal Circuit even stated that there is a, "general rule that courts will issue permanent injunctions against patent infringement absent exceptional circumstances." MercExchange, 401 F.3d at 1339. The old rule changed in May 2006 when the Supreme Court overruled the Federal Circuit's eBay decision. The Court rejected the general rule of issuing permanent injunctions and decided that the determination of whether to issue an injunction is just like any other case. eBay, 547 U.S. 391. Now, a patent owner seeking a permanent injunction must satisfy a four factor test before a court may grant such relief. She must demonstrate: (1) that she suffered an irreparable injury; (2) that remedies available at law, such as monetary damages, are inadequate to compensate for that injury; (3) that, considering the balance of hardships between the plaintiff and the defendant, a remedy in equity is warranted; and (4) that the public interest would not be disserved by a permanent injunction. In practice, this decision has made it nearly impossible to stop patent infringers from copying and selling to their hearts' and their bottom lines' delight. For instance, an infringer need merely say to the court, "If you stop me from producing this product, thousands of my employees will be out of a job, and on the public dole, which is against the public interest." Voila! No injunction. This sounds so much like the person who murders his parents asking for mercy, "because I am an orphan" that it must be a joke, but sadly, it is the law. We believe that the old rule, which valued innovation (and notice that this value is not considered in the four-part test at all) is the better one. We can hope that some day, the Supreme Court will have at least one scientist or engineer on its bench to represent the value that innovation confers on all Americans. At least we can dream. While searching online, I came across thousands of books - not on Amazon.com, but on Google! I could actually read the pages of those books because the words matched what I had searched, and most of the books were scanned right from the library. That's cool - and really useful, but I thought that Google couldn't just scan every book in the world because they were sued by a bunch of authors. What gives? "At the end of the Middle Ages, in a small town in the Rhine Valley, an unassuming metalworker tinkered with a rickety wine press, metal alloys and oil-based ink. The result of his labors was an invention that took the world's information and made it exponentially more accessible and useful. Six centuries later, we're seeing the same kind of innovation in the way we access information. Every day, with a few keystrokes on a computer, people are doing more than simply visiting their favorite web pages. Like Gutenberg, they are expanding the frontiers of human knowledge." The Authors' Guild and publishers sued almost instantly (Authors Guild v. Google, 1:05-cv-08136.) (After all, this IS America.) They claimed that Google had no right to make a digital copy of their books, and that it could only scan books that were in the public domain (books published before the mid-1920s.) That case has been in the courts since 2005. The publishers settled, allowing Google to scan away, but things remained stalled because the authors disagreed. They demanded $750 per book scanned. It's important to note that although Google was making a digital copy of each book, you can't just read the book on line. Google searches show a page that is a super version of one of those old card catalog things (you know, the ones you had to learn to use in elementary school, and that libraries have thrown away now that the "card catalog" is all on computer?) Sometimes, Google shows where you can buy or borrow the book, and a page or two, but not the whole book. Earlier this month, a federal judge ruled that Google's scanning is "fair use" under the Copyright Law. It may have taken him almost eight years, but this is a big thing. Judge Denny Chin, formerly of the U.S. District Court for the Southern District of New York, dismissed the lawsuit against Google. Judge Chin wrote in his ruling: "Google Books provides a new and efficient way for readers and researchers to find books. It makes tens of millions of books searchable by words and phrases." Google Books has become "an essential research tool, as it helps librarians identify and find research sources, it makes the process of interlibrary lending more efficient, and it facilitates finding and checking citations." "Traditionally underserved populations will benefit as they gain knowledge of and access to far more books," he wrote. "Google Books provides print-disabled individuals with the potential to search for books and read them in a format that is compatible with text enlargement software, text-to-speech screen access software, and Braille devices." The Authors Guild said it is "disappointed" in Chin's decision and plans to appeal it. "This case presents a fundamental challenge to copyright that merits review by a higher court," Paul Aiken, the group's executive director, said in a statement. "Google made unauthorized digital editions of nearly all of the world's valuable copyright-protected literature and profits from displaying those works. In our view, such mass digitization and exploitation far exceeds the bounds of the fair use defense." Bottom line: the lawyers will continue to make money, and you will have to wait a while longer to see if Google will be permitted to scan those hundreds of millions of books you have never read. Hang in there. If you ever doubted the economic importance of branding, take a look at the 2013 World Intellectual Property Report authored by the World Intellectual Property Organization (WIPO). For the period from 1987 to 2011, United States investments in branding accounted for close to a quarter of all intangible asset investments! Brand ranking organizations value the top 10 brands to be worth between 46 and 91 billion dollars, and between 2008 and 2013, the total value of the top 100 global brands grew by between 19 and 24 percent. Paralleling the enormous rise in value of the top brands is an equivalent "unprecedented" rise in the demand for trademarks. It should come as no surprise then that along with increased competition, brand owners are constantly pushing the envelope in their quest to attract loyal customers. Here's a great example of a major brand's recent attempt at expanding its trademark portfolio and the push back it received from a major competitor. 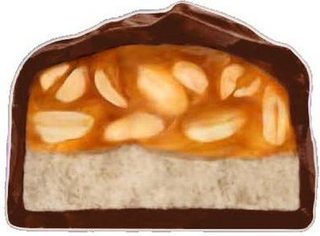 The Hershey Company recently filed a trademark application covering the cross section of its famed Snicker's bar. Hersey believes that the cross-section of its candy bar is distinctive enough so when a consumer sees it, he or she immediately thinks "Hershey." How about that for ego? Hershey met little resistance by the trademark examiner whose descriptiveness objection was swept aside by Hershey's contention that the candy bar's cross-section had acquired distinctiveness over time. The Examiner folded and moved the application on to publication. • The applied-for mark is "functional because it depicts a candy bar that results from a widely used and comparatively more efficient or less expensive method of manufacture for candy bars containing similar ingredients." • The applied-for mark does not indicate the source or origin of the product and, therefore, cannot function as a trademark. This is a great example of the interaction between aggressive branding, trademark law, and competitive forces. We will follow this story and let you know what happens. By filing a patent application and paying the filing fee, you are entitled to two reviews by the patent examiner. The examiner has a very short and strict time limit to review your application. If the examiner does not meet that time limit, then he or she may not meet productivity goals and may be denied raises and promotions. If the examiner does not meet productivity goals three times, then he or she is out of a job. By the second rejection of your application, the examiner likely has reached the end of the time allotted and can afford to give your application no more time. (1) File amendments that placed the application in condition for allowance. Such amendments generally are limited to accepting what the examiner has decided that he or she will allow. (2) File a 'request for continuing examination' and pay an additional filing fee for two more reviews. In addition to the extra cost, this option generally defers final resolution for another six to nine months. (3) File an appeal to the Patent Trial and Appeal Board. The cost for an appeal is at least several thousand dollars and average time to resolve an appeal is three years. You now have a fourth, and highly attractive, option: you can ask for additional consideration under the 'after final consideration' pilot program. The 'after final consideration' program gives the examiner extra time to review your application and hence makes the examiner willing to further consider your application. That further consideration may include an interview with the examiner and amendments to the claims. There is no filing fee to take advantage of the program and no additional delay. What's not to like?